Most people in Berlin are not interested in attending church. John and Gayle Butrin understand this, so they started a ministry called Matthew’s Table. The Butrins open their beautiful home to show the gift of hospitality for those who would never attend a traditional church setting. After decades of serving the American church in contexts we are all familiar with, this couple is reaching out to unreached individuals in a nonthreatening, Jesus way. In Matthew 9:9-12, we discover that Jesus had dinner with Matthew’s friends, even when these friends had negative reputations among the religious elite. This ministry reminds me that the gift of hospitality is one of the most important ways we can share the love of Jesus. We had an incredible night of fellowship with this couple, and were inspired to reach our friends through their example. 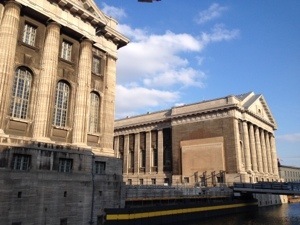 On Wednesday, we enjoyed beautiful architecture as we discovered more of Berlin. 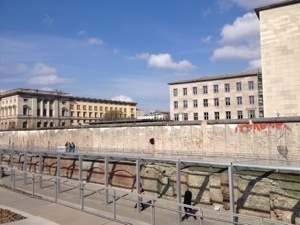 It was very haunting to visit sites from two unique eras of German history: the Nazi rule, and the division of East Berlin and West Berlin (and the country). The “Topography of Terror” museum reminded us of the evil that resides within mankind. The remnants of the Berlin wall reminded us of the strength of the human spirit, which is a gift from God. During the day, we had a long lunch with ministry leaders in Berlin, and it was such a rich time of learning and fellowship. 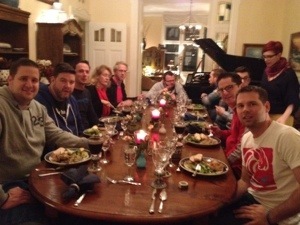 The evening ended with a ministry called Matthew’s Table. More about that in tomorrow’s article. 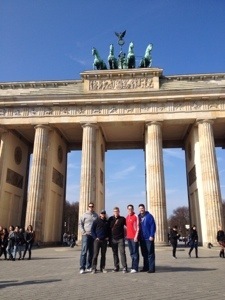 I’m on a trip in Berlin, Germany, to visit our missionary Aaron Alexander. John McKinzie and Aubrey McGowan of Hope Fellowship in Frisco, Texas; and Mike Burnette of Life Point Church in Clarksville, and are also on the trip. Due to a plane cancellation, Mike and I did not arrive until Tuesday morning (a day late). 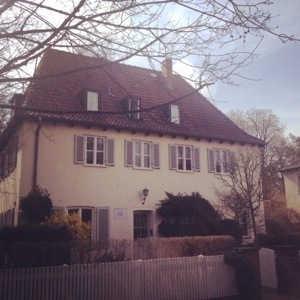 We immediately went to a private tour of Dietrich Bonhoeffer’s last home before his arrest and execution. Bonhoeffer is one of my historical heroes, so this visit was a true privilege. We then participated in an insightful driving tour of the city. That evening, we ministered at an event for college students called Chai Alpha. I was so impressed with the love the students had for one another, as this group is impacting a campus. Great conversations occurred and Christ was glorified. So encouraging!